Establishing a thriving business takes dedication and hard work. But all too often, business owners and managers find themselves too busy working to protect what they’ve worked so hard for to make time to put in place preventative measures as well. 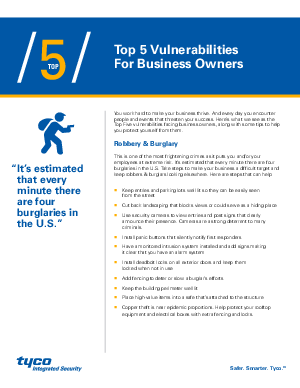 To make sure that more businesses are aware of the risks, we’ve listed the top five vulnerabilities business owners face every day. From burglary to vandalism to liability, see how you can tackle the risks with the right strategies.